Despite blogging regularly from 2014, this is the first time I am going to take the famous A to Z challenge. And I am super excited about it! For people who don't know what it is about, it is a blogging challenge where participants have to write 26 posts on the month of April, thematically from A to Z. I enjoyed doing NaNoWriMo and so I am sure, I will enjoy doing A to Z this April. Letters from the Soul. 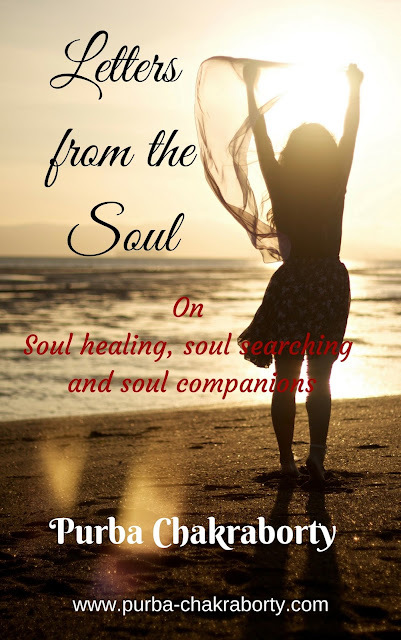 I will be writing 26 poems on soul-searching, soul companions, soul healing and so on. I plan to try different forms of poetry for this challenge to keep it interesting for my readers and myself. Last year, during the month of April, I lost my grandmother which left deep scars in my soul as she raised up after my mother passed away when I was twelve. I was extremely close to her. Nothing is perhaps more painful in life than dealing with the loss of a loved one, especially a family member. It leaves a void so deep that nothing can fill it. But when we look within and form a deep relationship with our inner self...our soul, it guides us to look at life from a fresh new perspective. It heals us, enlightens us and helps us make some beautiful connections in this lifetime. After all, the power is always within us. We just need to tap within and reconnect with our soul...our authentic self. We are our own medicine. The 26 poems that I will be penning down will be personal, richly drawn from the experiences of me and my close ones. I am thrilled to embark on this journey from 1st April. This is just a teaser of what's coming up. Looking forward to a poetic, emotional and exciting roller coaster ride! Hope to see you all on my blog this April. Wishing the very best to all the bloggers who will be participating in A to Z 2018. It sure sounds like you're not gonna why away to reach into the depth of your soul. Welcome to the challenge! And what an awesome theme. I know what you're talking about. I lost my mum almost ten years ago and it is a life-changing event. I'm in awe of your braveness. Sharing isn't easy, but it is healing. Sorry to hear about your grandmother. I hope the poetry writing is going well and you have a good AtoZ when it arrives. Awesome looking forward to read these soulful letters from you :-) Best wishes for AtoZ. I write poetry too. Five of my poems have been published in a book released by StarWords India. The poetry book is called "Melodies Of Spring" and the paperback be available in Flipkart and Amazon soon. Looking forward to all your poems in the month of April. I will surely be visiting this space throughout April. Hi! from a fellow poet. Sorry for your loss, not easy to cope or to share. All the very best for a successful challenge. What a delightful idea. Looking forward to reading more. That's an intriguing theme. I would love to read poems especially because it's also about soul healing which is close to growing from within. I believe it all starts from within. Hello, Purba, your theme is very interesting. I love to read this types of topic. Looking forward for your entry. Wish you all the best. Losing a loved one is inexplicable. Very true. The power is within us. So looking forward to read your series. I love the theme and am looking forward to a soulful journey along with you Purba. Soul is immortal! Good choice of theme Purba...will read all definitely.